Bus from Johor Bahru to Machang is the fastest and most convenient transport as compared to train and budget airline services. 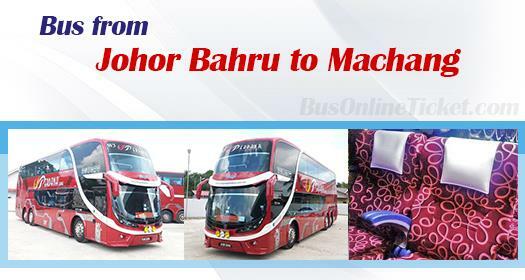 Train, Flight or Bus from Johor Bahru to Machang? First, train from Johor Bahru to Machang is not a direct service. Passengers are required to have a transit in Gemas. Second, train travelling duration is longest as compared to flight and bus. Therefore train is always not the first option among the locals. Flight is the quickest way by flying to Kota Bharu first and then changing to taxi or local bus to Machang. Due to the transit in Kota Bharu and expensive flight ticket, fight is not the popular option among the locals. Bus is the preferred option by locals especially working adults. The trick is that overnight coach service departing from Johor Bahru in the evening. Arrival at Machang in next morning suits working adult busy schedule. They could spare more precious weekend time with family and friends in their home town Machang. Perdana Express is the only reliable coach company in supplying bus from Johor Bahru to Machang. Perdana Express provides 1 daily departure at 8:45pm night. The journey from Johor Bahru Larkin Bus Terminal to SKMK Machang Bus Terminal takes about 9 – 10 hours depending on road traffic condition. Upon arrival at SKMK Machang Bus Terminal, passengers with destination at Machang are required to alight the bus. This is because the same bus will continue the journey to Pasir Mas before terminating at Kota Bharu. The bus fare at RM 65.00 is more expensive than train ticket but it does not deter the bus ticket sales. Passengers prefer to take overnight bus because they only spend the journey time in the night.. Kindly note that bus fare may adjust higher during festive season like Hari Raya. Passengers are encouraged to book ticket online in advance to avoid disappointment due to the limited bus service from Johor Bahru to Machang. The best way is to purchase the bus ticket with BusOnlineTicket.com which is the trustable and reliable portal among its customers throughout these years.